STAR TREK (2009) IN HD!! Hercules Runs Down What To Expect On That Fabulous New Blu-ray Set Due Out Tuesday!! I am – Hercules!! OLD BUSINESS Before we plunge into the extras on the new Blu-ray set , this is what I wrote about this year’s “Star Trek” three days before it opened in U.S. cinemas. If you don’t want to read a review of the movie itself, scroll past a big chunk of invisotext to where it says “NEW BUSINESS.” Hercules Gives J.J. Abrams’ New Kirk-Spock STAR TREK Five Stars Out Of Five!! J.J. Abrams’ enormously entertaining new “Star Trek” movie will prove the highest-grossing Trek movie BY A MILE, for 12 reasons. 1) IT’S A REPEATER. Things move so fast, and the film is so dense with imaginative plot and imagery, even people who aren’t sure they liked it could find themselves compelled revisit it, and revisit it with a cinema audience. As with “Star Wars” and “Raiders of the Lost Ark,” amazing things fly by at such a furious clip it demands to be seen more than once. 2) IT’S FOR DILETTANTES. And dilettantes drive worldwide box office. Moviegoers need bring no prior love for Kirk, Spock, McCoy or Orion slave girls to the cinema; “Star Trek” will make moviegoers love them all on its own. This is the first great big-screen effort from J.J. Abrams, a guy I’ve been calling a genius since the “Felicity” pilot. 3) IT’S FUNNIER. The new movie is likely the funniest Star Trek project to date, and certainly the funniest since the whale-centric “Star Trek IV.” Abrams’ name is not on the screenplay, but his sophisticated comic acumen suffuses the enterprise. If you will. I laughed more during this movie than I laughed during any non-Apatow movie released last year. 4) IT’S ROYALE. The new “Star Trek” is a corker for the same reason “Casino Royale” is: it had to be. Pine, Quinto, Saldana, Cho, Pegg, Yelchin and Greenwood look, sound and act little like Shatner, Nimoy, Nichols, Takei, Doohan, Koenig and Hunter, and it does not matter. Kirk, Spock, Uhura, Sulu, Scotty, Chekhov and Pike are reborn here as rich and compelling new characters played by new and, in some cases, more accomplished actors. 5) URBAN OFFERS REAL McCOY. 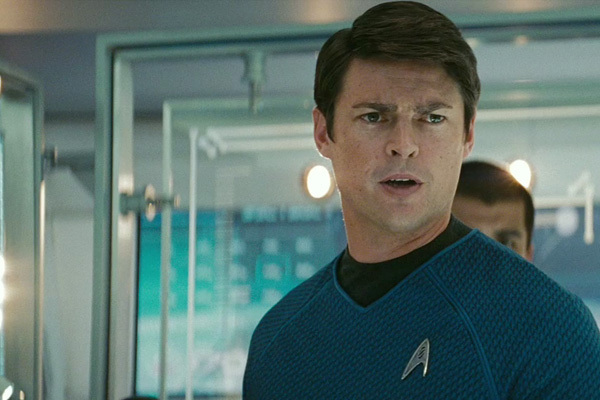 Every Trekkie will single out New Zealander Karl Urban’s beguiling performance as the medical officer in large part because he’s the only actor in the movie who succeeds in honoring not only his character but the actor who played his character 40 years ago. Urban takes a tough actor to impersonate, DeForest Kelley, and embodies him spectacularly. And because McCoy masterminds Kirk’s assignment to the Enterprise at a crucial moment, Urban is given a role that’s not only entertaining, but could not prove more pivotal to the Federation’s survival. 6) KIRK’S COOL. That scene that introduces us to Preteen Kirk – the one with the convertible and the robocop we’ve been watching for the last six months – is much more fun in its entirety, thanks largely to a completely unanticipated piece of music – utilized in a manner that filled me with a rare spasm of GLEE! GLEE!!! It is the perfect introduction to two-fisted supergenius James Tiberius Kirk and worth the price of admission in itself. 7) SPOCK’S HEART. 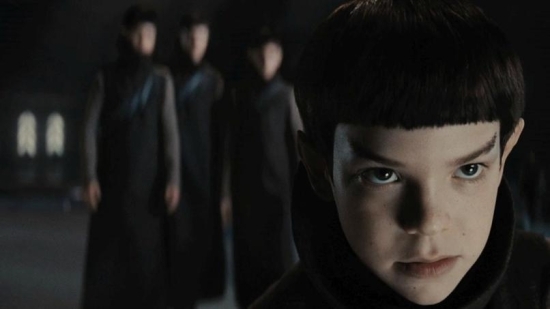 The minute we’re done with Preteen Kirk, we jump to tiny Preteen Spock as he navigates a Vulcan teaching machine hugely evocative of the one he navigated at the start of the whale movie. An adorable sequence, it makes you fall in love with this new Spock instantly. Which is key, because Spock is the movie’s heart. 10) BONUS NIMOY. Ever see “The Third Man”? You’re so absorbed in all the intrigue and suspense and comedy surrounding Joseph Cotton’s character that you kind of forget big-deal movie star Orson Welles is in the movie too – but boy is it cool when Welles finally turns up! Spock Prime is the Harry Lime of Abrams’ “Star Trek.” The most iconic thespianic element of the piece, he improbably kicks a perfectly splendid movie into a higher gear. * At one point transporters were going to teleport the infant Jim Kirk out of his mother’s belly, an act that would save him but kill her. * The same 23-year-old who created the “Fringe” opening titles also created the wonderful animated “Star Trek” title card and the wonderful planet-filled closing credits. * William Shatner’s famously odd pronunciation of “sabotage” had nothing to do with choosing the Beastie Boys song. * The close-ups of young Kirk in the convertible were all shot atop a 20th Century Fox parking lot. 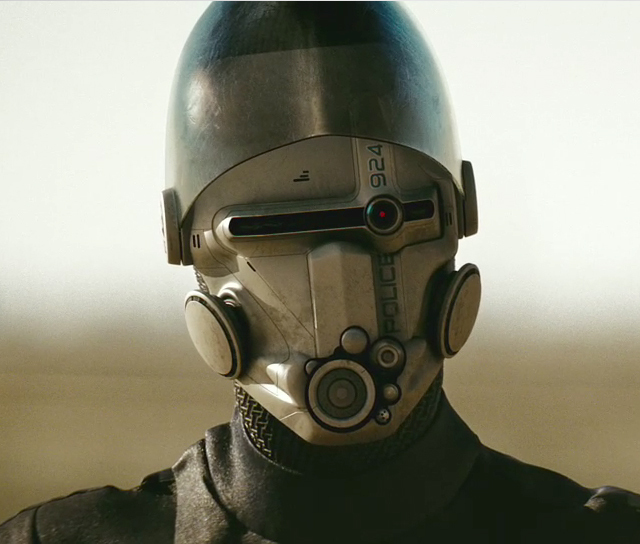 * We originally got to see the hoverbike cop’s face but it was ordered covered with a CGI mask because it was deemed silly-looking. * The big hole in Iowa in which Kirk ditched the car was indeed a quarry. * Abrams voiced the cop, and that he’s not sure whether the cop is robot or not. * Four of the big Vulcan learning bowls were real and the others were effects. * The first scene introducing adult Spock was shot in a real cemetery chapel with a big greenscreen behind it. * Screenwriter Akiva Goldsman plays one of Vulcan elders who cause Spock to quit Vulcan and join Starfleet. * The Iowa bar was actually an old American Legion bar in Hollywood. * ILM took the spokes out of Kirk’s motorcycle tires. 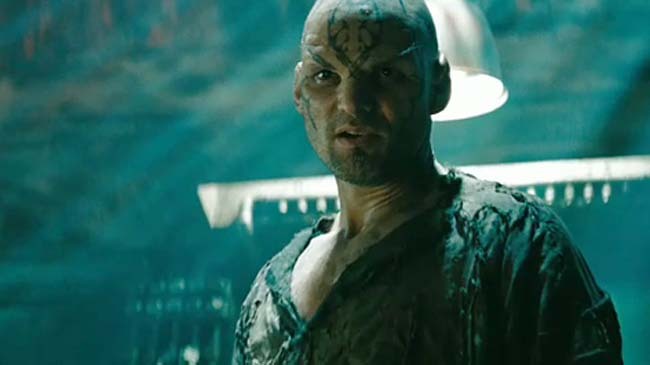 * Karl Urban wrote the line about where he got the name “Bones.” * Orci and Kurtzman worked with New Zealander Karl Urban on the “Hercules” and “Xena” TV shows (in which he recurred as Julius Caesar). * A good-sized shot of Nero in Klingon prison sneakily made its way into the final film. * The Kelvin bridge set was redressed for the Kobiashi Maru test. * This is the first movie Tyler Perry acted in that he didn’t himself produce. * A subplot in which the green Orion girl Gaila helped Kirk subvert the Kobiashi Maru test was cut in part because “Cloverfield” director Matt Reeves felt it made Kirk look too cocky. (You can still make out a pissed-off Rachel Nichols in the court martial scene.) * The shuttlecraft hanger is a real blimp hanger, and housed two “real” shuttlecraft among a sea of CGI ones. * As shuttles zoom off from San Francisco to confront Nero, you can see the U.S. headquarters for Tagruato Corp., which manufactures and markets Slusho. 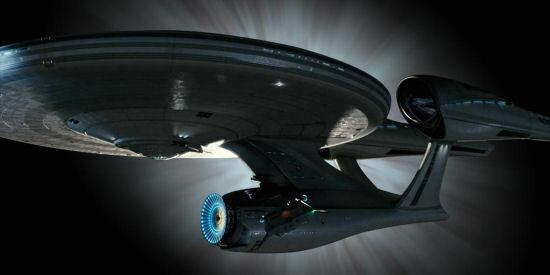 * Abrams loved the sequence in the Robert Wise movie that introduced the Enterprise. * Uhura’s initial station in the bowels of the Enterprise was shot in a refrigerated Budweiser plant. Those massive silver cylinders the Starfleet workstations are clustered around are full of beer! * “Transformers” producer Steven Spielberg repeatedly visited the set and ate sandwiches with the producers on the bridge set. * Cameron Crowe, after screening an early cut of the film, was astonished to learn Eric Bana played Nero. 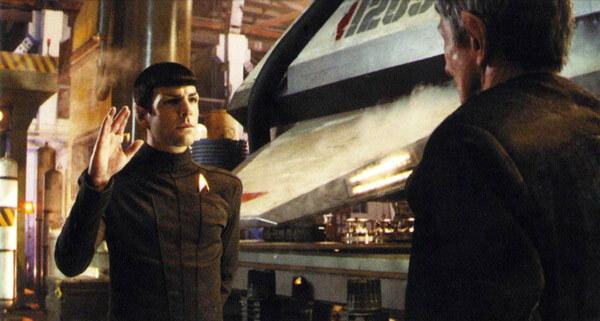 * Spock ordering Kirk out of the captain’s chair was improvised by Quinto during a rehearsal. * There are many stories of fan reaction at the movie’s first public screening at Austin’s Alamo Drafthouse. (Recall everyone was told they’d be watching “The Wrath of Khan” and got this instead!) * Genius British comic illustrator Bryan Hitch (“The Authority,” “The Ultimates”) helped design Spock’s squidship. * Scotty keeps a tribble in his office on the Vulcan moon. * Scotty’s base was also shot at the Budweiser plant. * Somebody (Orci?) suggests that Admiral Archer’s beagle Porthos should just show up in the last “Star Trek” movie Bad Robot ever produces. * Enterprise engine room, where they catch Kirk and Scotty? Also Budweiser! * Zach’s brother Joe Quinto plays one of Nero’s crew. * Nimoy wrote Spock’s final line: “Thrusters on full.” * There was thought of giving Nimoy’s movie-ending “These are the voyages …” speech to Shatner! DELETED SCENES (all in HD on the Blu-ray and all with commentaries by Abrams, Burk, Kurtzman and Lindelof): * “Spock Birth” (1:52) As strange fauna scuttles across Vulcan, we learn how Spock was named. * “Klingons Take Over Narada” (:46) The Romulans speak Romulan; the Klingons Klingon. * “Young Kirk, Johnny and Uncle Frank” (1:36) We meet Kirk’s older brother and jerk of an uncle. * “Amanda and Sarak Argue After Spock Fights” (:38) Amanda says Spock has to be Spock. * “Prison Interrogation and Breakout” (3:08) The Klingons all wear helmets that cover their foreheads and noses, neatly sidestepping the question of whether or not these Kirk-era Klingons have bumps. (Abrams’ Romulans, remember, also eschew the forehead appliances introduced in “The Next Generation.”) Curiously, the Klingon inquisitor (Victor Garber) and Nero speak English in the latter part of this sequence! * “Sarek Gets Amanda” (:22) Spock’s dad, on a Vulcan hoverbike, beckons his wife to seek shelter from the Romulan attack. * “Dorm Room and Kobayashi Maru (Original Version)” (3:59) We see green Orion girl Gaila’s role in Kirk’s unprecedented victory. * “Kirk Apologizes to the Green Girl” (:54) A really funny scene dropped along with a subplot about Gaila’s role in helping Kirk conquer the Kobayashi Maru test. * “Sarek Sees Spock” (:12) Spock’s father doesn’t really see Spock Prime; he just senses him as he walks by. * “Casting” (28:53) Learn Quinto decided he wanted to play Spock after someone mentioned him for the role on a message board. 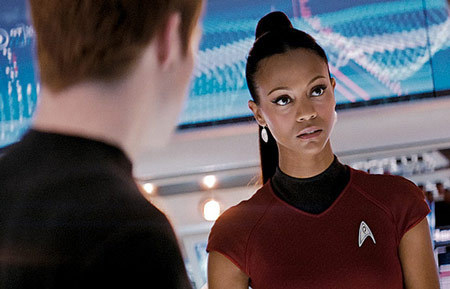 See footage of Saldana chatting with Nichelle Nichols on set. Learn that Urban was watching the “Trek” box sets with his son when he heard about Abrams’ film. Learn that Cho worked with Abrams on “Felicity.” Learn Burk thinks Cho “couldn’t look less like George Takei.” Learn Abrams feared fan anger when he wanted to cast the Korean Cho to play the Japanese helmsman Sulu, but relaxed a bit when Takei told him Roddenberry’s Sulu was supposed to represent all Asians on the show. (Which is why Sulu doesn’t have a Japanese name.) Learn that Yelchin loves Chekhov because Chekhov was chasing tail in “The Apple” while everyone else was working. Learn that Russian-born American-reared Yelchin is a chess genius. See Abrams introducing Yelchin to Walter Koenig. Learn Pegg used to watch the show nightly on BBC2. 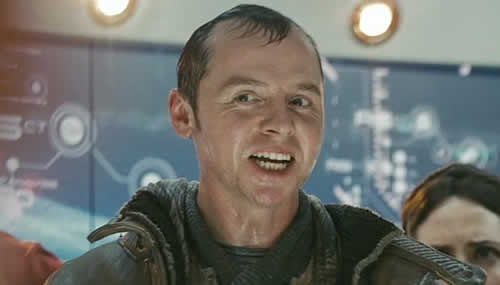 Learn Pegg is married to a girl from Glasgow. Learn Greenwood’s role as John Kennedy in “Thirteen Days” led to him playing Pike. Learn Abrams thinks Greenwood is “literally the funniest guy I ever met in my life.” See an emotional Nimoy bid the production goodbye. * “A New Vision” (19:31) A look at what “Star Wars” lover Abrams brought to the new film. Hear Kurtzman describe “Trek” as classical and “Wars” as rock. Learn Abrams used a lot of the same crew he used on “Mission: Impossible III.” Learn Trek was shot anamorphic and on film. Learn that a lot of those lens flares were created by dudes pointing flashlights into the camera, and a lot of them were created by dudes with computers. Watch as Abrams personally vibrates the cameras during shots by shaking their magazines. Learn small children were used to double Kirk, Nero and Klingons. * “Savage Pressure” (3:08) A look at Scottish first assistant director Tommy Gormley, who loves to say “savage pressure!” for reasons on which I’m unclear. * “Starships” (24:33) Learn that the Kelvin was already supposed to be an unusually old Starfleet vessel at the time it was sacrficed. (If you can catch a close-up of the captain’s chair, you can see it’s been distressed.) Learn existing locations were used for ship interiors to better give a sense of the vessels’ immense size. Learn the Long Beach power plant that doubled for the innards of the Kelvin was built in the 1930s. 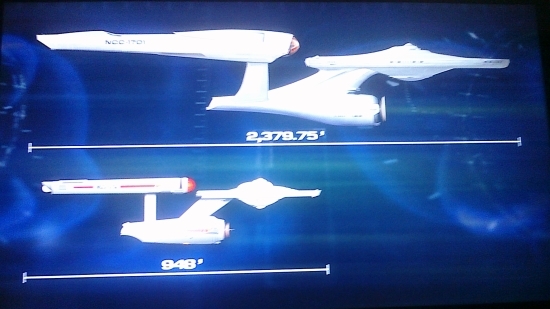 Learn that this movie’s Enterprise is more than twice the length of the one Kirk commanded in the TV show and prior movies. (2,380 feet vs. 948 feet for the original.) Learn the hull of the Queen Mary partially inspired the design of the new Enterprise hull. Learn the Budweiser plant used for Enterprise interiors was the one in the San Fernando Valley, just east of the Van Nuys Airport. Learn cast and crew had to wear helicopter headsets to communicate because the Budweiser plant was so noisy. Learn Uhura’s original Enterprise workstation was in a part of the plant always maintained at 41 degrees Fahrenheit. Learn the bridge went through three phases of design: the first looked like a cross between the Enterprise-D and something out of “Wall-E,” the second looked too much like the 1960s TV show bridge, and the third and final was a hybrid of the first two. (Like so many aspects of this production, all three highly detailed illustrations depicting the bridge are gorgeous and suitable for framing. And the final design of the bridge was certainly best of the three in my view.) Learn Urban and Pine visited the under-construction bridge set the day the met. Learn Orci was among the last to sit in the captain’s chair and Kurtzman could never bring himself to sit in it. Learn the Narada was seven miles long. Learn the Narada CGI model was so big a single CGI frame of it could take 24 hours for computers to generate. * “Warp Explained” (1:22) A look at the now-much-darker bussard collectors at the front of the nacelles. * “Paint Job” (1:14) A look at the Enterprise hull “prism paint” that pays homage to the Enterprise of the 1980s movies. * “Bridge Construction Accelerated” (1:18) A frame-a-day look at the bridge coming into being. * “The Captain’s Chair” (:45) Learn the buttons on the chair’s arms really work. * “Button Acting 101” (1:44) Learn Cho was often hitting “buttons” that didn’t really exist. * “Narada Construction Accelerated” (1:20) A frame-a-day look at the Narada interior coming into being. * “Shuttle Shuffle” (1:46) Learn the military transport on which Kirk and McCoy meet was supposed to be 30 or 40 years old. * “Aliens” (16:30) Learn the alien helmsman on the Kelvin bridge was named Kasia, and he was a male played by a very thin woman. See Deep Roy getting made up as Scotty’s sidekick. Learn this production pioneered “seamless” Vulcan ears. See Nimoy giving Abrams notes on the ears. Learn it was easier to Quinto to pluck his own eyebrows because he could tell when the tweezers actually got hold of something. Learn the biggest ice monster on Delta Vega was named Big Red. Learn in the original script, the ice planet was a desert planet. Learn Big Red actually makes his home in the oceans of Delta Vega. * “The Alien Paradox” (1:40) A look at dancer/performance artist Paradox Pollack, who created alien movements and coached actors in how to use them. * “Big-Eyed Girl” (1:35) A look at how they created the memorable look for the alien medical professional who tends to Winona Kirk. * “Big Bro Quinto” (1:26) A look at Quinto’s big brother Joe, who was recruited into playing a Romulan while visiting the set. * “Klingons” (1:57) Learn Victor Garber, who played the Klingon interrogator, was given a crinkly Klingon nose to wear beneath his helmet. * “Drakoulias Anatomy 101” (1:35) Learn the snow creature that gets attacked by Big Red was conceived as a hybrid of a gorilla and a polar bear. (Which would make it a mugato, wouldn’t it?) Learn the Drakoulias originally had very visible testicles. * “Planets” (16:10) Learn that Vulcan exteriors were shot at Vasquez Rocks, where Shatner fought the Gorn. Learn the drilling platform above Vulcan and the snowy Delta Vega exteriors were filmed simultaneously in different parts of the Dodger Stadium parking lot. Learn the Starfleet shuttle hanger was actually a 170-foot tall Tustin, Calif., blimp hanger built in 1941 that still services blimps. Learn the Long Beach city council hall built in the 1970s served as the Starfleet Academy auditorium. Learn that the Cal State Northridge library built in the 1970s served as Starfleet Academy’s exterior. Learn the Iowa sequences were shot in Bakersfield. Learn the production planted 80 acres of wheat in Bakersfield. Learn the Iowa granite quarry young Kirk almost falls into is 600 feet deep and situated in Vermont. * “Extra Business” (2:29) A look at the production’s army of background performers. Learn they sleep a lot between takes. Learn DGA trainee and extra wrangler Lauren Pasternack is hot stuff. * “Confidentiality” (2:45) A look at efforts to keep as much about the production secret as possible. Learn there was a whole “confidentiality team” comprised of as many as 40 production assistants. See the covered golf-cart that drove Quinto from his trailer to the set. Learn in the spoiler-foiling scripts McCoy’s lines went to “Henry” while Spock’s were uttered by “Gil.” Learn Pine was photographed in his cadet uniform while peeing just outside the Tustin blimp hanger. * “Props and Costumes” (9:22) Learn the guy who invented the first flip phone based the device on Trek’s communicators. Learn the movie’s communicators allow the user to see to whom he’s speaking. Learn large pieces of the movie’s phasers flip quickly and dramatically when they’re switched from “stun” to “kill.” * “Klingon Wardrome” (1:08) We learn how the Klingon uniforms, which all looked like elephant hide, were made without harming a single elephant. * “Ben Burtt and he Sounds of Star Trek” (11:45) A look at sound designer Ben Burtt and his work on the new “Trek.” Learn Burtt was an early Trekkie and took the sounds of the TV show as an inspiration for this work on the original “Star Wars.” Learn that Burtt could not watch the earliest episodes of “Star Trek” when it was first broadcast because his college was situated too far from the transmitters of any NBC affiliate, so he had his father make reel-to-reel audio recordings of the episodes. Learn Burtt could not track down how the series’ original sound effects were created. Learn Burtt’s tennis shoes sqeaking on his kitchen floor and the hiss of a trolley car’s doors opening were combined for the new Enterprise’s doors. Learn Burtt used an ancient Moog synthesizer to recreate many of the series’ memorable sound effects. See the chimes used to create transporter materialization. See how a long Slinky-like wire coil, a c-clamp and a step-ladder were used to create the photon torpedo fire. * “Score” (6:28) Learn movie composer Michael Giacchino watched “Trek” as a kid and still owns the action figures he had back then. See his orchestra play the original Alex Courage theme. Hear him explain why it wasn’t used until the end of the movie. Learn an odd-looking Chinese violin was used to perform Spock’s theme. See Abrams play the banjo. * “Gene Roddenberry’s Vision” (8:47) A look at how the pioneering efforts in the areas of civil rights and space travel influenced the TV show’s creator. Learn that Orci hopes there’s an interplanetary federation watching us right now, waiting for us to become advanced enough to join up. * “Starfleet Vessel Simulator” Interactive HD tours of ILM’s CGI Enterprise and Narada. You can fire phasers and torpedoes or play short videos that give you wrap-around looks at the Enterprise’s main bridge and corridors – or a glimpse of the Narada’s sinister extraction drill. * “Gag Reel” (6:22) Flubs, foul-ups, dancing and lots of Abrams thumping a wireless microphone. It ends with Pine and Quinto aboard Spock’s squidship, performing their entire scene with Scottish accents. * “Teaser Trailer” (1:18) Welders create an Enterprise in Iowa as Spock says, “Space: The Final Frontier.” * “Theatrical Trailer: The Wait Is Over” (2:14) Kirk dumps a car in the quarry, plus footage of Spock and Nero that didn’t get into the movie. * “Theatrical Trailer: Prepare for the Beginning” (2:17) Pike dares Kirk to do better. May 8 is promised. * “Theatrical Trailer: Buckle Up” (1:03) Uhura wonders aloud if Kirk knows what he’s doing.